Craig Custance is a journalist who spent the last decade covering the NHL as a national hockey writer, including six years with ESPN.com and ESPN The Magazine. He left ESPN to join The Athletic, a San Francisco–based sports media startup. He is currently an NHL Insider for The Athletic and editor-in-chief of The Athletic Detroit. Before working at ESPN, Custance wrote for The Sporting News. He spent the first 10 years of his writing career with the Atlanta Journal-Constitution after graduating from Michigan State University. He lives in Clinton Township, Michigan, with his wife, Cassie, and three children, Calvin, Cameron, and Cormac. You can follow Craig on Twitter @craigcustance or read more of his work at www.craigcustance.com. Sidney Crosby has captained the Pittsburgh Penguins to three Stanley Cup Final victories, in 2009, 2016, and 2017. He is a two-time winner of the Hart Memorial Trophy and the Conn Smythe Trophy, as well as two Olympic gold medals and a gold medal at the World Championships. The mind of an NHL coach is a strange and dangerous place. It’s comprised of equal parts genius and maniac, tactician and trickster. Some coaches utilize a level-headed approach, others rely on passion to motivate. Some are known for nurturing talent, others for disciplinary methods. But one quality unites each and every one: They all love to talk hockey. 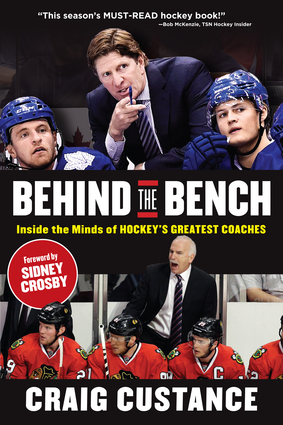 Behind the Bench offers fans a chance to grow their understanding of the sport they love. The stories Custance reveals in this book will enlighten and entertain, eliciting laughter and thought that will change the way readers engage with their favorite sport. No hockey fan’s library is complete without this must-read title. Craig Custance is a journalist who spent the last decade covering the NHL as a national hockey writer, including six years with ESPN.com and ESPN The Magazine. He left ESPN to join The Athletic, a San Francisco-based sports media startup. He is currently an NHL Insider for The Athletic and Editor-in-Chief of The Athletic Detroit. Before working at ESPN, Custance wrote for The Sporting News. He spent the first ten years of his writing career with the Atlanta Journal-Constitution after graduating from Michigan State University. He lives in Clinton Township, Michigan with his wife Cassie and three children, Calvin, Cameron and Cormac. You can follow Craig on Twitter @CraigCustance or read more of his work at www.CraigCustance.com.